Creating with Allie: Additional items added to Sale-A-Bration!!! Hello Friends!! 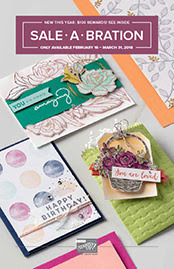 I just wanted to let you know it is still Sale-a-bration time and to make it even better Stampin' Up! released a few more products that you can get for free!!! Click on the Picture below to see the new products being released!! !